Ursa Minor (Laitin: "Smawer She-Bear", contrastin wi Ursa Major), an aa kent as the Little Bear, is a constellation in the northren sky. 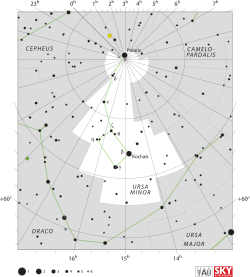 ↑ 1.0 1.1 1.2 1.3 1.4 "Ursa Minor, Constellation Boundary". The Constellations. International Astronomical Union. Retrieved 12 May 2014. ↑ 2.0 2.1 Department of Astronomy (1995). "Ursa Minor". University of Wisconsin–Madison. Retrieved 27 June 2015. This page wis last eeditit on 20 August 2015, at 15:17.